History gives you a quick overview of visitors by showing their names, the time when they signed up, and their waiting duration. 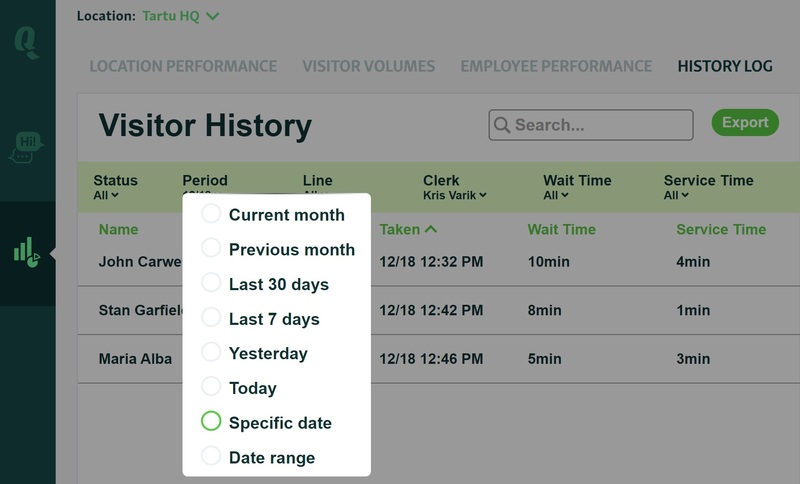 Filter history by Wait Time or Service Time. You can export more detailed info on the last 10,000 tickets to Excel spreadsheet. Taken – Time when visitor signed in. New – Visitor is waiting. Called – Visitor is called for service. Served – Visitor has been served. Canceled – Visitor was removed from the queue. Wait time – How long a visitor waited to be served. Called – Time when the visitor was called to be served. Service Ended – Time when the service ended. Service Time – Duration of the service. Clerk – The clerk who served the visitor. Additional – Any additional visitor information such as First Name, Last Name and Phone Number (and any Input Fields). NB! By setting up custom Input Fields, your clerks can fill in detailed information about your customers. This data can then be seen and exported on the history page. This can be especially valuable for managers as it allows them view and analyze all of that gathered data in Excel.